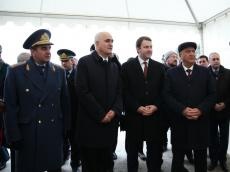 Azerbaijan and Russia are cooperating to create comfortable environment for cargo transportation, Shahin Mustafayev, Azerbaijani Minister of Economy, said during an inspection of the automobile bridge under construction across the Samurchay River on Feb. 8, Trend reports. The minister said that Azerbaijani-Russian relations are developing at a high level. "The development of relations can be observed in all fields, particularly in political relations. Russia is the main partner of Azerbaijan in the non-oil sphere. The trade turnover between Azerbaijan and Russia is growing every year. Compared with previous years, this figure grew by 20 percent," Mustafayev said. According to him, work is underway to increase trade turnover in the future. Mustafayev also said that the development of the non-oil sector of the Azerbaijani economy is designed specifically for export.
" Azerbaijan carries out joint activities with Russia for the convenient transportation of goods and cargo in this regard," the minister added.